Embrace of the Serpent is a beautiful philosophical film set in the conflict-ridden Amazonian jungles of Columbia in the early 1900s. 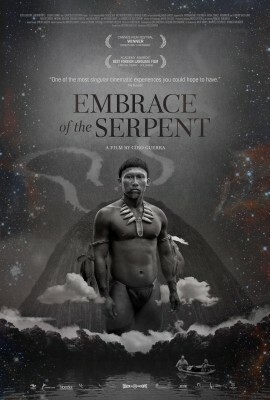 Embrace of the Serpent is a Colombian film that follows two storylines anchored by the same indigenous man, Karamakate, who may be the last of his tribe. The first storyline has scientist Theo and his guide Manduca seek help from Karamakate on a quest to find a plant that would cure Theo’s illness. The second storyline happens decades later. Another scientist, working off of Theo’s diary, also seeks the yakruna plant. This time, in Karamakate’s old age, he has lost his memory and the scientist, Evan, becomes the guide. The scientist characters are based on real life scientist/explorers Theodor Koch-Grunberg and Richard Evans Schultes. The two stories are each other’s equal and opposite and drive home the cyclical nature of life. Embrace of the Serpent is shot almost entirely in black and white. While it did make me yearn to see the no doubt beautiful colours of the Amazon rainforest, I think it was a smart artistic choice for the film. The only moment of colour is a sequence of trippy visuals that portray the dream that connects the three main characters. This moment is made punchier by the fact that it is the only colour after almost two hours of black and white. I also feel that the black and white helped make the indigenous peoples in the film not seem like some exotic spectacle, and instead as actual people who just lead different ways of life. Throughout the parallel journeys, the unlikely travelling partners come face to face with the destruction caused by settlers’ pursuit of rubber and the cultural genocide perpetrated by missionaries. Dichotomy is huge in this film. Everything in the film has another version of itself and it becomes clear that neither version is wholly right or objectively true. Embrace of the Serpent is a long, quiet film. It won’t be for everyone, but if you can get in a zen headspace, it is definitely worth it.